A Storrington man has narrowly avoided prison after his ‘aggressive’ and ‘petulant’ driving caused a three vehicle crash on the A27. Sussex Police has released CCTV footage from the bus involved in the collision near Shoreham in November 2015 which shows Lee Allwright’s action. The 29-year-old from West Street, Storrington, pleaded guilty at Worthing Magistrates on Thursday, January 12 to dangerous driving. He was given a two year ban with extended retest, 200 hours of community service and around £835 in fines and costs, being told he narrowly avoided 12 weeks imprisonment, according to police. 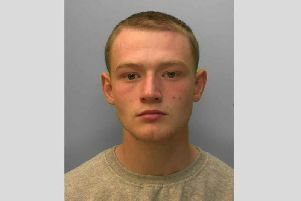 Police said at around 7.30am on November 27, 2015, Allwright was driving his Peugeot 308 joining the slip road from Shoreham onto the eastbound A27 and ‘aggressively’ overtook a BMW X3 as they both joined. The driver of the BMW flashed him and Allwright braked ahead of the BMW and stopped in the middle lane of the dual carriageway. His action caused the Compass bus to hit the BMW which then shunted into his Peugeot, police said. PC Jon Bennion-Jones, from the Arundel road policing unit, said: “Fortunately, there were no passengers on the bus and the incident was caught on their CCTV system. This could have been much more serious and could have resulted in someone being injured or killed. “Allwright’s actions show his total disregard for anyone else and how a moment of madness has cost him his licence.